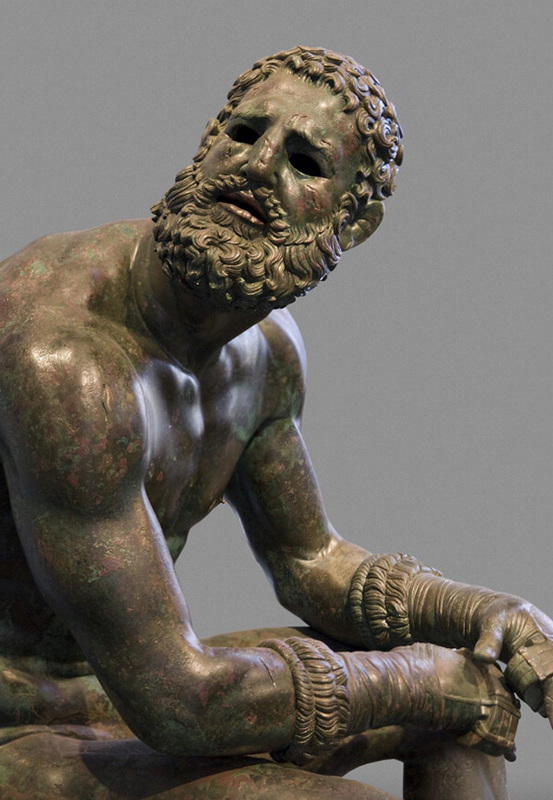 The Seated Boxer is one of the most admired ancient works of art. Since it was found in 1885—on the slopes of the Quirinale, where the Baths of Constantine stood—the sculpture has provoked intense debate. Its date and maker remain unknown. Some were initially deceived by the inscription “Apollonios Nestoros” (Apollonios, son of Nestor) found on the left glove in 1927. 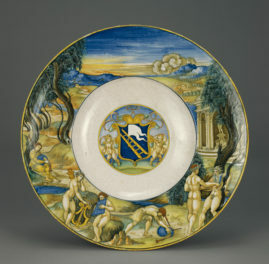 Others date the work to the end of the 4th century B.C., attributing it to the sculptor Lysippus and his school. Still others have considered it to be a product of the 1st century B.C., attributing it to an unknown sculptor capable of mixing different styles and sensibilities. And who is the figure? Some have identified him as the Boxer of Quirinal, who won at Olympia for the first time in 336 B.C. following a gruelling career of continuous defeats. Others say he is Polydamas, an athlete of legendary strength who was born in Tessaglia and then called to the court of Persia by Darius II. Yet others call him a historic figure or a heroic mythical one. 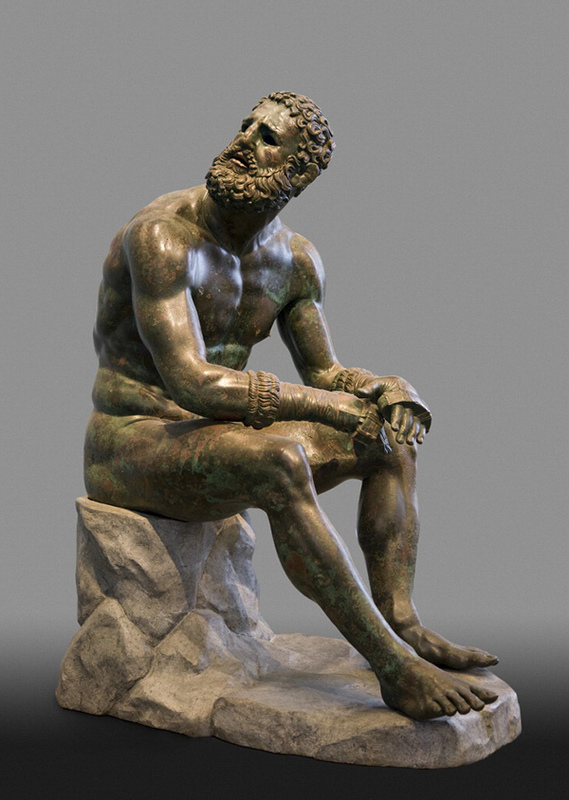 Shown by the artist in the act of turning his head when something special is happening (the Greek concept of kairós), the boxer is seated, profoundly marked by deep cuts and copious bleeding all over the right side of his body. We don’t know what that turn of the head means: has he perhaps just heard the referee’s decision? Another call to fight? Is it a look at the excited crowd? Or perhaps a mute questioning of Zeus in search of some answer? The numerous controversies unleashed in the attempt to explain that gesture have informed all the mystery and poetry that has surrounded him, all the seduction of the work. In composing a poem inspired by the Boxer, it was natural for me to speak of that moment from his point of view. I decided to do so without opting for one interpretation or another. 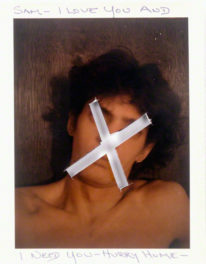 Every time we analyze a work we profane it, we attack its irreducibility. Poetry should never be reduced to explanation. Real poetry always moves beyond any calculation, any system, any geometry: it is incompleteness, evocation, lament, shiver. Before writing “Boxer” I could do nothing but sing of his fragility and solitude; of the weight of his dramatic life and the tragic sense of death, of banality, that belongs even to ancient masterpieces we would wish to be eternal. The uncertainty that has often surrounded their attribution, the mutilated and fragmentary condition in which they have almost always come down to us from antiquity, gave me the cue to speak of the transience of life, of every one of man’s works, of the meaning of time. “…All that is body is as coursing waters, all that is of the soul as dreams and vapors. As for life, it is a battle and a sojourning in a strange land; but the fame that comes after is oblivion,” wrote Marcus Aurelius in his Meditations. A slow fall into forgetting, indifference, the inorganic: not even our great works are immune, despite our desperate attempts to preserve them. Poem by Gabriele Tinti, read by actor Robert Davi in the galleries of Power and Pathos at the J. Paul Getty Museum. Videos created in collaboration with the Italian Cultural Institute of Los Angeles. Gabriele Tinti@Robert Davi reads “The Boxer” Part I – Getty Museum from gabriele tinti on Vimeo. Gabriele Tinti@Robert Davi reads “The Boxer” Part II – Getty Museum from gabriele tinti on Vimeo. I am an Italian poet and writer. I have worked with the J. Paul Getty Museum, the Metropolitan Museum of Art, the British Museum, the Los Angeles County Museum of Art, the National Roman Museum, the Archaeological Museum in Naples, the Ara Pacis Museum, the Musei Capitolini, and the Glyptothek of Munich composing poems for ancient works of art including the Terme Boxer, the Discobolus, the Arundel Head, the Ludovisi Gaul, the Victorious Youth, the Farnese Hercules, the Hercules by Scopas, the Elgin marbles from the Parthenon, the Barberini Faun, and many other masterpieces. My poems have been performed by actors such as Joe Mantegna, Michael Imperioli, Burt Young, Alessandro Haber, Robert Davi, Vincent Piazza, and Franco Nero.